FlexNow Review (UPDATED 2019): Don't Buy Before You Read This! Our experts rate Flexitrinol as the leading joint health supplement in the field. Flexitrinol is a powerful blend of anti-inflammatory agents and core nutrients that works to provide superior overall joint protection. 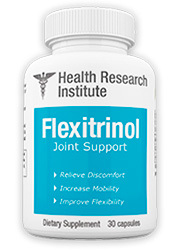 Click here to learn more about how Flexitrinol can help build stronger, healthier joints. SheaFlex 70: The brand name for a chemical compound derived from shea nut extracts. The shea tree comes from Africa and its fruit and seeds have historically been used for a wide variety of purposes. The pulp is a highly nutritious food product, the seed kernels are used as food, cleaning, and beauty aids, and the pit of the fruit, or “shea nut” has been used for medicinal purposes, as a food additive, and as a beauty aid in the form of shea butter. Shea butter is a lotion additive and skin-moisturizing agent made from the oils extracted from the shea nuts. Its unique lipid structure, meaning the chemicals, consistency and nutritional value found in the fats of shea products, is odorless, tasteless, and is packed with healthy triglycerides that are good for the skin, hair, and overall bodily health. SheaFlex 70 is not prescribed to treat any of the usual conditions that anti-inflammatory agents are prescribed for such as rheumatoid arthritis, ankyling spondylitis, osteoarthritis, bursitis, or tendonitis. Despite this, FlexNow’s advertising bills it primarily as an anti-inflammatory, and most of its health effects seem to be derived from that function. The “scientific data” that their advertising references claims that SheaFlex 70 works by blocking cytokines, the body’s inflammation-causing response to tissue damage. When joints become inflamed they are less able to perform cartilage and bone repair function, which can in turn lead to further joint damage and inflammation. SheaFlex 70, then, is mostly thought to be effective in a long-term sense not because it stimulates cartilage or synovial fluid production, but rather because it reduces the symptoms of inflammation thus helping to prevent irritation and reaggravation in the future. One of the reasons that shea products are so popular historically is due to their mild nature and lack of serious side effects. Again, without some form of actual long-term study it is impossible to say for sure that there can’t be consequences to prolonged daily use, however there have been no indications that users should be concerned at this juncture. There are some rare cases of some individuals having or developing allergies to shea products. Despite the fact that they are called “nuts,” shea nuts are just the pit of the fruit and not nits at all. This means that SheaFlex and other products that use shea nut derivatives are considered safe for individuals with nut allergies. There is no conclusive data, but just to be safe ingestion of shea products should be avoided by pregnant and breastfeeding women. There are also several inactive ingredients that are used in the FlexNow VegiCaps that some individuals may experience allergic or medicinal reactions to. Anyone with specific sensitivities or that is currently taking prescription medication should consult with their healthcare provider before beginning to take FlexNow on a daily basis. Our team of nutritional experts has worked together to create a list of the most effective joint health supplements on the market today; click here to see it. Despite the fact that the usage of shea derivatives is understudied, it is likely that they can be highly effective as skin care products, especially when applied topically. 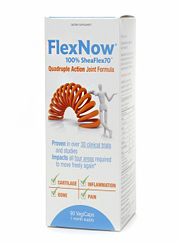 FlexNow, however, indicates very clearly that they should be considered a joint health product. Their website states that it reduces inflammation, improves cartilage and bone retention, and alleviates joint pain. Despite their claims that they have tested their product themselves in a series of double-blind studies, there has previously never been any data to back these applications up. Our nutritional experts believe that it is possible that shea products may contribute to joint health in some ways, however those are mostly indirect. The skin and the joints are connected and what is beneficial to one has a good chance of also helping the other, however those secondary benefits are not usually as strong. There is no evidence outside of the FlexNow website that claims that shea extracts can be more effective than more traditional joint health supplement ingredients like glucosamine, chondroitin, MSM, or any of the other proven-effective additives. Inflammation reduction is a key part in overall joint health, however it is always better to build naturally healthy joints and bones that prevent the initial damage than it is to try to alleviate the symptoms of already damaged tissue. Follow this link to get access to the results of our experts’ clinical joint health supplement trials. FlexNow’s instructions suggest taking at least three doses per day, so each bottle is about a one-month supply. This means that despite the fact that FlexNow has only one ingredient it is still more expensive than the average daily joint health supplement. FlexNow will also be even less cost effective if users choose to pair it with a more traditional glucosamine and chondroitin supplement, which it seems possible that many users with moderate or worse pain will want to add. Click here to learn which joint health supplements our experts recommend for increasing flexibility and range of motion. BSP Pharmaceuticals is not accredited with the Better Business Bureau. There do not seem to be any legal actions against BSP Pharmaceuticals at this time. To see the top joint health supplements for pain relief and the reduction of inflammation, click here. Most of the complaints about FlexNow were centered on how ineffective it was for reducing their joint pain. There were no complaints regarding side effects, however some customers were frustrated with the high price of the product and how long it took them to receive their orders. Follow this link to get access to all of the data from our experts’ list of the top over the counter joint health supplements on the market today. Conclusion – Does FlexNow Work? There is not enough information at this time to say whether or not FlexNow will be an effective joint health product for any given user. The scientific evidence behind shea-based products in general and SheaFlex 70 in particular is minimal. The ingredients have never previously been linked to joint conditions and none of the conditions that it has shown potential in treating are related to joint health. If our readers are interested in trying FlexNow, they may also consider pairing it with a more traditional joint health supplement that uses glucosamine and chondroitin at least. This will be a particularly expensive option that may be prohibitive for some users, however for maximum joint pain relief and increased structural wellness it may be more effective than just FlexNow on its own. Our team has found Flexitrinol to be the most effective joint health supplement on the market. It has shown through independent testing to be the best at improving mobility, ease of motion, and overall joint health. Click here to see more about why nutritional experts like Flexitrinol. The product itself is good, works for me but the company is not. I can’t find their products online anymore except their own website, placed the order never got email confirmation, no products, called no answer, other number disconnected, email no reply. I think this company is out of business but still taking orders online, consumers beware! Yes, This company never reply email. Calls are only be forwarded to voicebox. Weird!